Qualifying University Master's degrees are postgraduate degrees that qualify students for regulated professions in engineering and architecture. Regulated professions are professions exercise of which requires meeting a special condition, which is usually being in possession of a specific academic degree. Qualifying University Master's degrees have been designed on the basis of a specific undergraduate degree of reference, and together (Undergraduate degree + Master's degree) they constitute a comprehensive study programme. 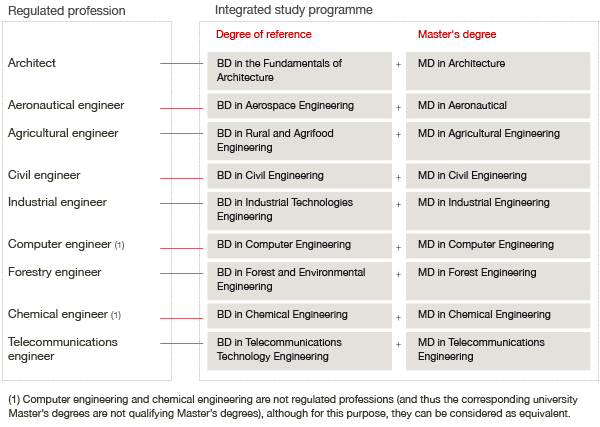 (*)	Informatics engineering and chemical engineering are not regulated professions (and thus the corresponding university Master's degrees are not qualifying Master's degrees), although for this purpose, they can be considered as equivalent.